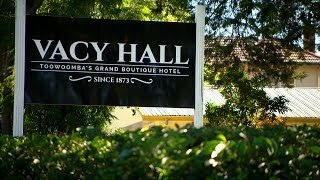 Vacy Hall is a small and charming historic hotel with soul. Guests love their beautiful rooms, delightful art, magnificent garden and warm and friendly hospitality. In 2018, Tripadvisor admitted Vacy Hall into it's Hall of Fame. For the last seven consecutive years (2012 to 2018), Tripadvisor has awarded Vacy Hall a Certificate of Excellence which is recognition we are a consistent favourite with travelers. With a fabulous inner city location, Vacy Hall is close to major retail outlets, traditional pubs, restaurants, quirky cafes and antique and art galleries. They are proud to be one of "Australia's Great Historic Hotels". Come and see why. This gorgeous large suite has a Queen sized bed and a king single bed with room to add two rollaways if needed. It is a beautifully decorated room of very grand proportions and has direct access to the veranda through large cedar bay step-through windows with window seats. It also has a beautiful large open fireplace with an original antique mantle-piece and big comfy armchairs. The fireplaces work and are reset every day with a fresh supply of firewood so you can enjoy the delight of an open fire in your room. Central heating and electric blankets mean you'll be warm in winter and in summer the building maintains an even temperature with cool shady verandas protecting the rooms. This room has its own private (exclusive use) bathroom across the hall. If a fireplace is used during your stay a daily charge of AUD25 will be added to your room account to cover the cost of firewood and the cost of cleaning and resetting the fire. These rooms have a double-size English oak timber bed, your own private bathroom across the hallway (exclusively for your use) and chairs with views of the garden. These charming rooms open onto the northern verandah (in full sun in winter and full shade in summer) with table, chairs and steamer lounges. There is a capacity for up to three people with an extra rollaway bed - a real value for money proposition. There are two Standard Double Rooms available- the Magnolia Room and the Pagoda Room. If you would like to book a particular room, please request it specifically and they will try to accommodate you. These rooms have a double-size bed with an en-suite bathroom. There is a capacity of two in this rooms, which are some of our most popular rooms offering charm, amenity and value. There are two Standard Double Ensuite rooms - The Rose Room and The Briarwood Room. The Rose Room opens onto the northern verandah (in full sun in winter and full shade in summer) with table and chairs. The Briarwood Room is located at the rear of the house with a view of the vine-covered courtyard garden. If you would prefer a particular room, please request it specifically and we will try to accommodate you. A room of very grand proportions with King sized antique four poster bed and big comfy leather chesterfield lounge in front of the fireplace with large cedar casement step-through bay window allowing direct access to the veranda where there are table and chairs to catch the morning sun for breakfast. Central heating and electric blankets mean you'll be warm in winter and in summer the building maintains an even temperature with cool shady verandas protecting the rooms. This suite can accommodate one additional rollaway bed. The fireplace works and is reset every day with a fresh supply of firewood so you can enjoy the delight of an open fire in your room. If a fireplace is used during your stay a daily charge of AUD25 will be added to your room account to cover the cost of firewood and the cost of cleaning and resetting the fire. This is the only large suite that has an interconnecting door to an adjoining room. This makes this large suite appealing to travellers who may have others accompanying them that require their own privacy. There is a queen-sized brass bed as well as a small ensuite bathroom. This gorgeous suite has direct access to the veranda through large cedar bay step-through windows with window seats and a beautiful large open fireplace with an original antique mantle-piece and big comfy armchairs. Please note that if you use a fireplace a charge of AUD25 will apply to cover the cost of firewood consumed and extra cleaning costs. Central heating and electric blankets mean you'll be warm in winter and in summer the building maintains an even temperature. There are three Queen Fireplace Rooms - The Blue Room, Lavender and Lace, and The Garden Room all have ensuite bathrooms. Bathrobes are provided and each room has a fully working fireplace. Most rooms open onto the verandah where tables and chairs are provided. If you would prefer a particular room (there are three to choose from), please request it specifically and they will try to accommodate you. Please note that if you use a fireplace a charge of AUD25 will apply to cover the cost of firewood consumed and extra cleaning costs. In 1880, they didn’t make beds any bigger than the exquisite Emperor sized all brass four-poster with a lace canopy that now adorns this suite. There’s also a small single bed suitable for a child. This large luxury suite is of grand proportions, it has a large open fireplace with its original antique mantle-piece, plus a big comfy leather chesterfield and a couple of armchairs as well as en-suite bathroom. This Large Luxury Suite is perfect for special occasions, celebrations, indulgence, wedding nights, high-rollers, and academy award-winning movie stars (but they can’t tell you who) and visiting Royalty. If a fireplace is used during your stay a daily charge of AUD25 will be added to your room account to cover the cost of firewood and the cost of cleaning and resetting the fire.